Câbles Midi Il y a 5 produits. 6m Black MIDI Cable assembled with 5-pole DIN connectors NYS322AG. The connectors have turned metal shells and heavy duty cable clamps. The 5 pins are wired 1:1. 3m Black MIDI Cable assembled with 5-pole DIN connectors NYS322AG. The connectors have turned metal shells and heavy duty cable clamps. The 5 pins are wired 1:1. 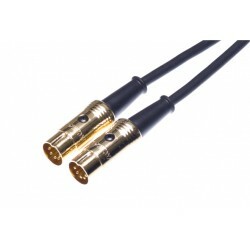 1.5m Black MIDI Cable assembled with 5-pole DIN connectors NYS322AG. The connectors have turned metal shells and heavy duty cable clamps. The 5 pins are wired 1:1.